"I wish Dad was here celebrating Eid with me." The day before the start of the Eid al-Adha holiday is the day of Arafa. It is said that a believer who fasts on this day expiates the past year’s sins and the sins of the coming year. As it is considered to be a day of forgiveness from sin, many Palestinians fasted on that day. Despite me fasting, I eagerly accepted the offer of my friend, a solidarity activist from Holland, to have a walk in Jabalia Camp. Approximately 108,000 registered refugees live in the camp, which covers an area of only 1.4 square kilometres. I passed by the Jabalia market, which was so crowded that one has to keep pushing people out of his way in order for him to pass through. With every step forward I could glimpse many faces of different ages, genders and features. I could see children jumping around from one stand of clothes to another, excited to pick their new outfits. At the same time, other children seized the opportunity of this unusually large crowd. They were carrying heavy boxes containing simple goods, trying to earn some money so that they could help their poor families have sort of happy atmosphere, to at least buy some candies. 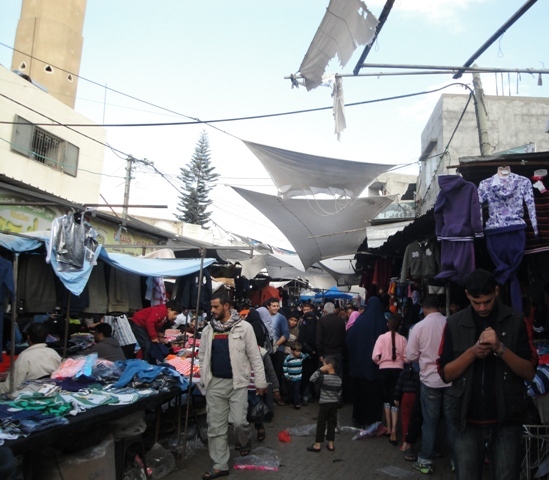 As Gaza welcomed Eid al-Adha, hymns played as the sun dawned. I could hear children and men gathering around the microphone in the mosque right behind our house, singing continuously and happily in one voice, “Allahu Akbar, Allahu Akbar …” I couldn’t help but wake up earlier than I always do, and more energetic than ever, excited for what would come next. My mother said that the door has been knocked on constantly since the early morning by people with Eid greetings. Some of them could afford to buy sacrificed animals, “Uḍhiyyah,” and hand out a slice of meat. On the second day of Eid, there was a demonstration in solidarity with our detainees at the Red Cross headquarters to convey that their spirits live among us, and that they are never forgotten. We also meant to show sympathy with the mothers who waited many long years, hoping for their sons’ freedom, who passed away before they could celebrate their release. It was a day of support for our heroes inside the merciless Israeli bars, encouraging them to stay steadfast, as well as a day of compassion for their families, who have passed through several important holidays with one, or in some cases more than one missing, making their happiness incomplete, to help them stay strong and optimistic. While celebrating Eid, I felt blessed for having all the people I care about around me. At the same time, I felt like I couldn’t enjoy my happiness at its fullest while thousands of people in Palestine couldn’t feel this blessing. How can Palestinians fully enjoy our happiness while these heartbreaking stories are so very common in their daily lives? I hope next year the happiness of Eid and other occasions will be complete, with the Israeli jails emptied and Palestine independent and free. Insha’Allah, God willing. This entry was posted on November 6, 2011 by Shahd Abusalama. It was filed under Life in Gaza, Palestinian Political Prisoners and was tagged with Eid, Gaza, Israel, Muslims, Palestine, Palestinian Political Prisoners, Palestinian prisoners, prison, Prisoners, Swap deal. I want to be very brief, I enjoyed reading ur article…It's a moving article, filled with subtlety, honesty, & beauty. An expressive one in many ways, but also its about our history, the sad one.Frankly, I fought back my tears after I had read the story about Gomana Abu Jazar, becaue it touches what we want to forget about some many people suffer around us…You put the light in something we always have to remember it…. hope that 2 , insha'allah.what a mazinG expressions u described , touchinG words, full of foggy hope dreams. I read your blog for the first time. You write very well. I live in Brasil and I don’t understand some things on your blog:1) Behind the blog name, there is a map where there is only one Palestine. What about Israel? If you don’t accept Israel existence, how can you imagine they can react? Do you really thing with such a position will be peace?2) You mention a Palestian refugee camp Jabalia. How can you explain a refugee camp in your own country? They are not refugees, but citizens. Why do you call them refugees?3) I think people like Gomana will continue suffering if Gaza people and also Israel people don’t realize that one must live in 2 states.What do you think about that?